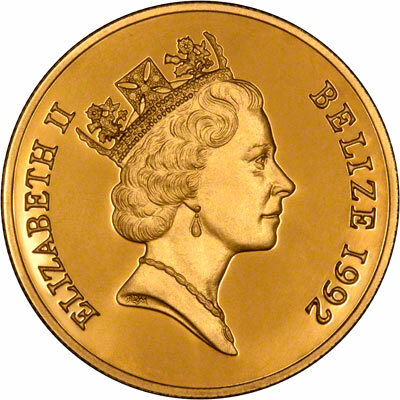 There are brief notes about Belize coins on our main Belize page, but here we list only sets of proof gold coins, rather than individual coins. 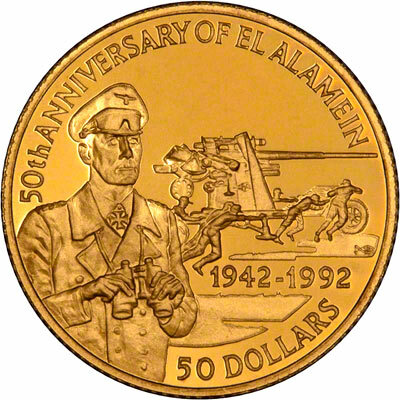 To commemorate the 50th anniversary of the Battle of El Alamein, the Central Bank of Belize authorised the Royal Mint to issue a limited quantity of magnificent four-coin gold proof collections. On 30th October 1942, at El Alamein, General Bernard Montgomery led 200,000 allied troops against the German Afrika Korps led by General Erwin Rommel. By dawn Montgomery's men had made good progress but it was not until 3rd November that Rommel's front line was penetrated. The following day saw Rommel's troops in full retreat and, having been driven back through Egypt and Libya, the feared Afrika Korps were finally defeated on 15th November 1942. 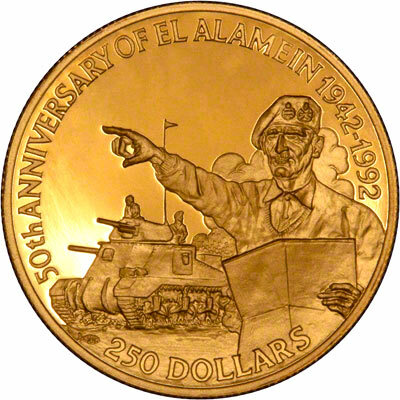 All four coins in this commemorative collection bear superb reverse designs by Dutch sculptor and medallist Willem Vis, each featuring the inscription 50th ANNIVERSARY OF EL ALAMEIN 1942-1992 along with the denominational value. The $25 depicts Crusader and Sherman tanks crossing the desert towards the west, pursuing Rommel's troops through North Africa. The $50 shows German gunners preparing an 88mm gun. In the foreground, with fieldglasses and dust goggles, is General Rommel. The $100 features British infantrymen during an assault on German positions. Fighting in the hardest of circumstances, the common soldier was often engaged in the most dangerous work of all. The $250 portrays General Montgomery, holding a survey map as he leads the 8th Army Corps into an attack. An M3 General Grant tank can be seen in the background. The obverse, shared by all four coins, bears the elegant portrait of Her Majesty Queen Elizabeth II by sculptor Raphael Maklouf. 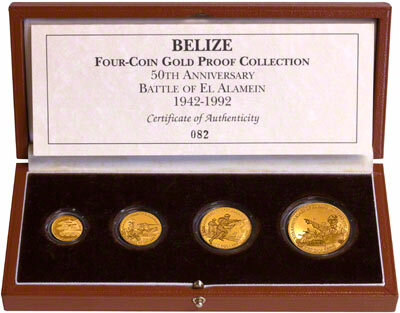 Each of the coins in this collection are legal tender within Belize and has been struck to superb proof quality. Please contact us prior to ordering to check prices and availability.